Overland Park is the largest suburb in the Kansas city metropolitan area. It is located in Johnson County and according to the 2010 census it has a population of around 176,000 residents. The city lies on the Osage Plains a few miles south of the Kansas River. 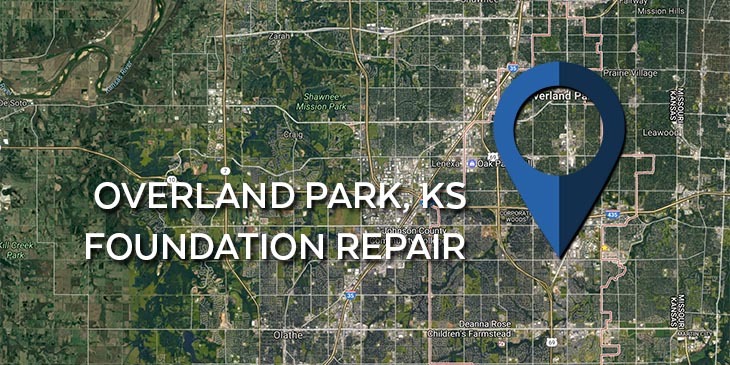 To those who are in need of foundation repair in Overland Park or in the surrounding area, KC Pro proudly serves to keep your home safe and sound. This city was founded by William B Strang Jr back in 1905. This subdivision was named Overland Park and was the site for the first airplane flight west of the Mississippi with shows by the Wright brothers. Overland Park was incorporated as a “first class city” with an initial population of 28,000 residents. The population has continued to grow over time and is now the second most populous city in Kansas. If you find that your home is having foundation problems such as cracks, leaning walls or chimneys, or a sinking foundation, then you need to have a professional take care of the issue. KC Pro proudly provides foundation repair and for the surrounding areas for you home. KC Pro has several foundation repair systems to overcome the damage already done. One of these procedures is called underpinning. When we underpin your foundation we will use helical and steel piers to relieve stress on your home and provide additional structural support. The piers are driven deep into the soil below your home until they reach the stable footing of bedrock, from there, the opposing end is placed under the foundation, as seen above. The longer you leave foundation cracks unattended the higher your chances of water leakage become. Water takes the path o least resistance, therefor, cracks become easy to navigate paths for potential moisture. This could possibly result in mold growth, wood rot, and damage to your personal belongings. You’ll want to find a specialist with the skills and know how to make your home safe and dry. Our professionals at KC Pro also specialize in basement waterproofing, so you don’t have to worry about your basement every time there are heavy rains coming in. We have many waterproofing services to satisfy your home’s needs. Whether you need the services of wall crack injections to stop leaking or exterior waterproofing, we have you covered. If you are in need of foundation repair Overland Park KS or in the surrounding areas, then contact us today at KC Pro.